Apart from scheduled charter flights to the fleshspots of southern Turkey, most journeys in Turkey start in Istanbul. Istanbul, Constantinople, Byzantium, the name may have changed over the past 2,000 years but the place is the same: the gateway or division between Europe and Asia formed by the natural thin 22 mile stretch of water called the Bosphorus running almost due north to south from the Black Sea. But it has not been an easy ride. Even going back to the time of Herodotus and the 5th century BC there was conflict between the Greeks and the Persians since when nations, civilisations and religions have fought over this strategically vital area on both sides of the Bosphorus which have been jealously guarded by each incumbent in turn. Byzas the Greek realised the importance of what is now known as the Golden Horn as a natural harbour, hence the name Byzantium but at the end of the 1st century AD the Greek luck ran out and the Roman Emperor Septimus Severus ransacked the city and slaughtered most of the population. 150 years later the Romans fell out with each other and Emperor Constantine proclaimed himself Emperor of the West defeating Emperor Licinius in a naval battle in the Sea of Marmara, renaming the city after himself, Constantinople. Christianity was the official religion and, to mark this, the first Hagia Sophia (literally Holy Wisdom) oly Holwas completed by Emperor Justinian in AD 537. During the next 500 years, the city was attacked by a series of hopeful invaders including four cracks by the Russians, about whom more later. However the city walls held firm under a succession of pretty moderate rulers until along came the ruthless Basil who rounded up one invading army and, blinding ninety nine out of each hundred, sent them packing. Then came the Crusades and much fighting (and huge looting by the Crusaders) between the emerging Selcuk Turks, the Byzantines and the enlisted Latin mercenaries. Due to infighting among the various factions, this situation lasted until the end of the 12th century when in the last of a succession of attacks by the now all powerful Osman Turks in 1453, the city fell with 4,000 defenders lying dead. The city became part of the Ottoman Empire under the Sultan, Mehmet the Conqueror. The next 350 years was a golden age for Constantinople. For many it was regarded as the cultural and trading capital of the world. 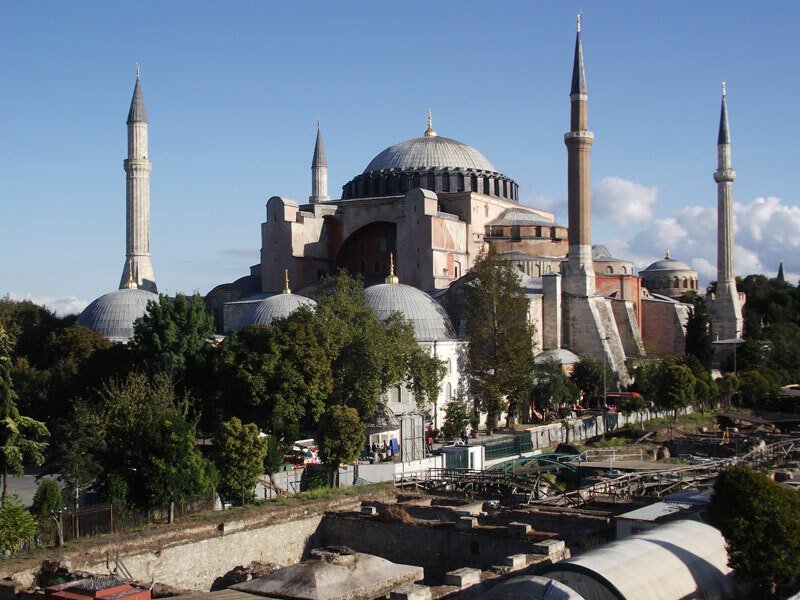 Christianity gave way to Islam and the Hagia Sophia was reconsecrated as a mosque but Christianity was never banned. The quite amazing and huge Topkapi Palace, the home for four centuries of the Sultan and his family, consists of four main courts with surrounding buildings. 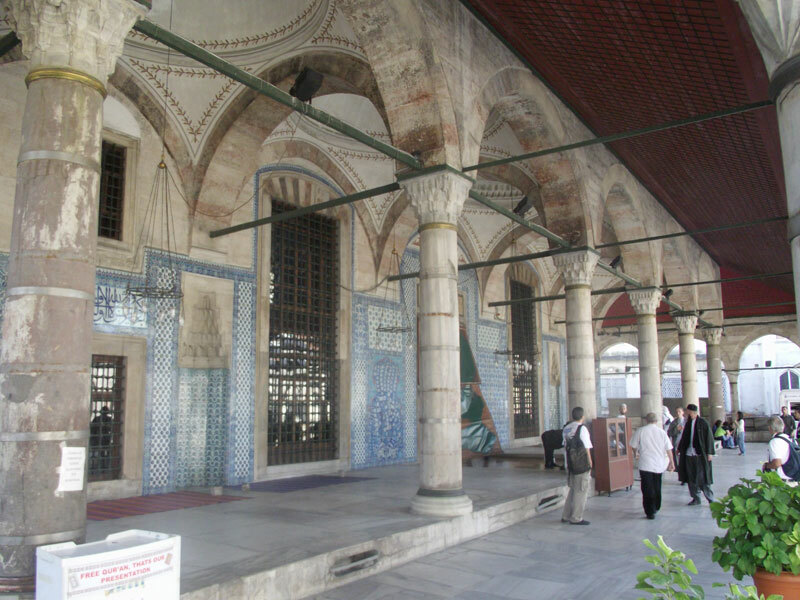 Construction started in 1459 and continued over long periods; the harem, for instance was built in 1540. The Sultan was the absolute ruler but his Court was enormous including the Imperial Council and the Janissaries, (specially trained elite soldiers who served as the private guard to the Sultan). The kitchens, for instance, catered for five thousand. Directly under the Sultan was the all important Grand Vizier, a mixture of Adjutant, Company Secretary and Regimental Sergeant Major. Also of paramount importance was the Valide Sultana or Mother of the Sultan. She wielded immense power and, among other things, controlled the Harem which was guarded by a unit of mainly black eunuchs. It was the Valide Sultana who selected the girls and decreed which of them could be made available for the Sultan. Under Muslim law slaves, which is really what the girls were, were not allowed so all the girls were either Christian or Jews. Many were Russian – blondes being popular with Sultans. As time went on intrigue, rivalry between siblings, intense jealousy and drunkenness leading to murder, torture and incarceration lead to a weakening of power at the top. The beginning of the end came in the years immediately following 1683 when the Imperial Army suffered a string of defeats and in a century a huge decline had set in. The indifferent and pleasure seeking Mehmet IV was deposed by the Grand Vizier and his brother, Suleyman, fared no better. The Janissaries were out of control, threatening and killing ministers; plagues and epidemics wrought havoc with the population and by the time Selim III came to the throne in 1789, the position was desperate. He summoned Western help and started to reform the army but the Janissaries got wind of it and murdered him. It was not until 1826 when a strong and Good Sultan, Mahmut II got control of the situation finally crushing the Janissaries. He and his son, Abdul Mecit re-established law and order, initiated the first city police force and improved medical facilities to tackle the plague. Furthermore they moved out of the confined insularity of the Topkapi into a new and grand Palace, the Dolmabahce on the opposite side of the Golden Horn and 2 miles down the Bosphorus. After the Crimean War and following the death of Abdul Mecit in 1861, the Ottoman revival was shortlived. In 1884 the Russians had another go and seized Ottoman land in the Balkans and what is now Georgia. Sultan Abdul Hamit panicked and went into virtual hiding. Revolt under the pseudonym Reform took place and the Committee of Union and Progress deposed the Sultan and after a bloodthirsty skirmish in Taksim Square, took over power. The Ottoman Empire was over. During the First World War, Turkey found itself on its own and in desperation allied with Germany but apart from their famous victory at the Dardenelles, they were on the losing side. However a new hero emerged from the shadow of defeat – Mustafa Kemal and in 1923, after the last and by now only a figurehead Sultan, had fled, Kemal, known thereafter as ‘Attaturk’ was appointed President. Since the 17th century the name ‘Istanbul’ started to be used as an alternative to Constantinople but it was not until 1935 that Attaturk officially banned the name Constantinople and pronounced that the city should be named Istanbul. Here endeth the potted history. Now, where to go and what to see in Istanbul? 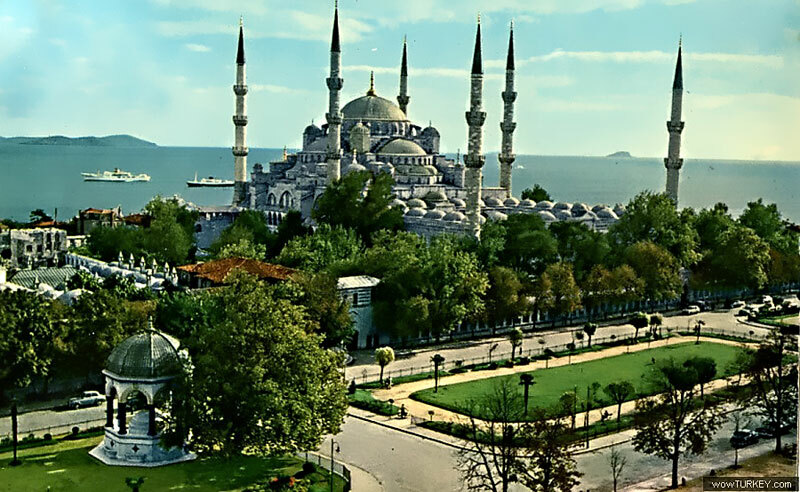 It depends on the time you have available; you could spend a month in Istanbul and not go to the same place twice but, as a suggestion, say you only have three or four days it is better to be based in the area called Sultanahmet. Here most of the places and buildings mentioned above can be visited on foot from your hotel. But first, I strongly recommend that you engage a good guide. 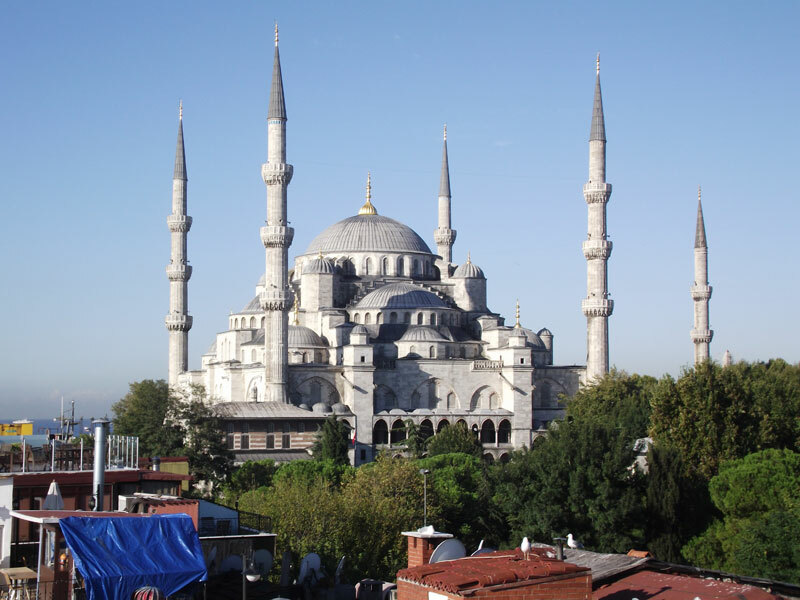 Start with the Blue Mosque; quite sensationally beautiful and a great curtain raiser to set the tone. Next to the Blue Mosque is the Hippodrome, a large rectangular square where chariot races took place in Roman times, various monuments and trophies from overseas conquests are located, famous demonstrations and massed meetings were held and major proclamations made – a bit like the Plaza Mayo in Buenos Aires. 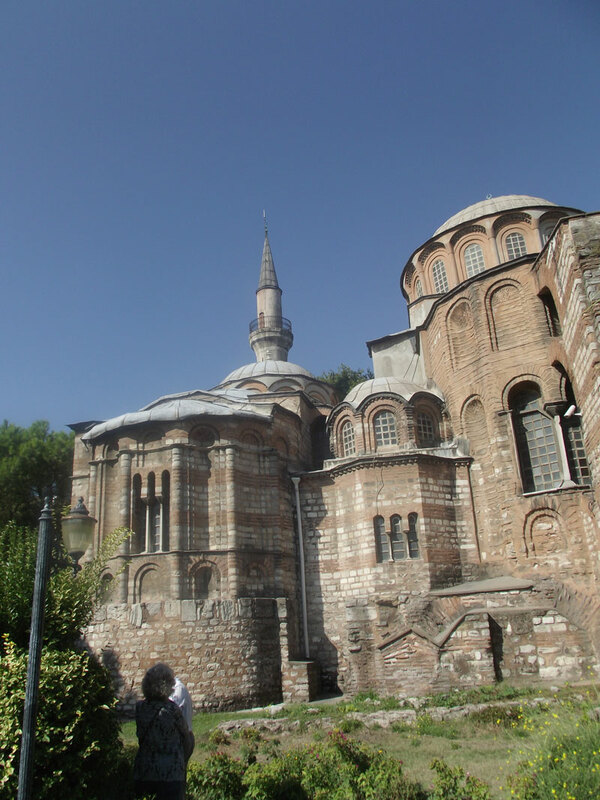 It is but a short walk from there to the Hagia Sophia, now a museum and dedicated as such by Attaturk. It is vast and quite stupendous, the most incredible example of architectural and construction skill and bravery. To go ‘upstairs’, for instance, you don’t just mount a staircase, you walk uphill along a cobbled street wide and strong enough for a pony and trap to pass. 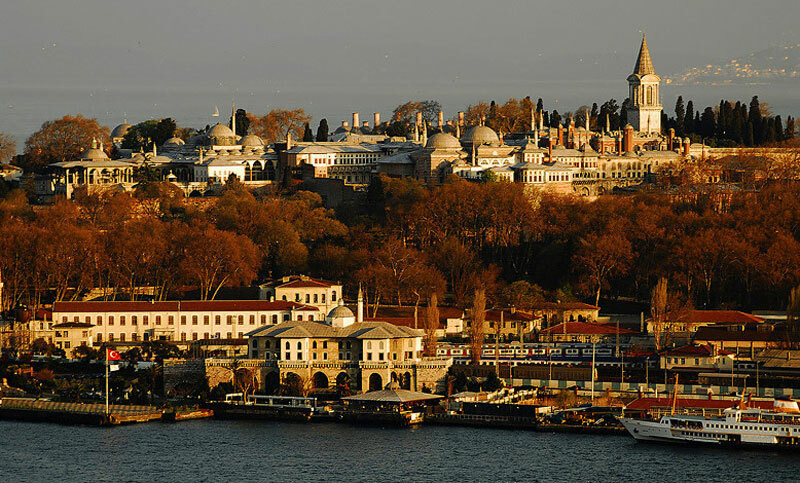 To visit the Topkapi, next to the Hagia Sophia, allow a good half day. The area is so large and there is so much to see. Also next to the Hagia Sophia and the Topkapi is the Yerebatan Cistern, a vast underground reservoir supported by three hundred and thirty six columns and built by Emperor Justinian at the same time as the Hagia Sophia. 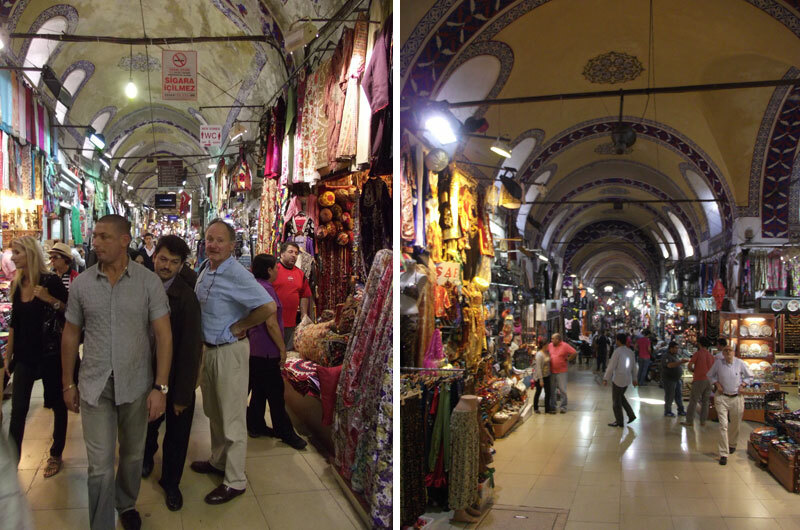 You can’t leave Istanbul without going to the Grand Bazaar, again within easy walking distance. A covered labyrinth of four thousand, five hundred shops, stalls, restaurants, banks, chapel, mosques – everything housed in a 15th century building. Terrific atmosphere (if you like shopping), bargaining is a Turk’s middle name, a lot of the merchandise is good quality and much is unashamedly copies of the real designer labels but at a fraction of the cost – particularly leather goods and jewellery. It is very easy to get lost in the Grand Bazaar; I have several times but shop and stall owners are always very pleased to help with directions either to the way out, to other shops or anywhere else. For other places further afield, the wonderful Chora Church is a must; tucked away in a quiet area nestling up to the old walls of Constantinople; this quite small church which is now a museum is decorated, if that is the right word, with the most fabulous mosaics depicting religious scenes from the Bible. Quite brilliant and in amazing condition, they are on the walls and ceilings of this 5th century church. To go here you will need a car and driver. You could combine Chora Church with a visit to Dolmabahce Palace which houses amazing collections of furniture and glass including a four ton crystal chandelier presented to the Sultan by Queen Victoria. On the way back it is worth passing through the Spice Bazaar next to which is a very lovely and intimate small mosque called Rustem Pasa built in 1561 and featuring a huge covering of blue Iznak tiles. For a bit of nostalgic glamour and romance, nearby is Sirkeci Station where the original Orient Express train used to arrive. The arrival and departure hall is decorated with old photographs and posters. Stand on the empty platform and imagine the dramatic arrivals and tearful departures that took place in the glamorous thirties. The Gelata Bridge over the Golden Horn should be included, a two story structure with bars and cafes underneath the vehicle and tram carriageways above which connect with the Beyoglu district, more commercial than Sultanahmet and a mass of streets, shops and offices. The main attraction is the Gelata Tower which, since its inception in 1348, has served many purposes such as an observatory, prison, fire spotting station and nightclub. It is, however, a great landmark being quite close to the Gelata Bridge. Much is made by tour operators of a Bosphorus cruise. In my opinion it is fine for the first 10 to 15 minutes but then becomes slightly monotonous; all you do is to sail down one side of the water and come back on the other. Some of these organised cruises take the best part of a morning or afternoon and one can see far more on dry land. It should be noted that Istanbul, a metropolis of around twenty million inhabitants, is busy all year round. It is a fabulous place to visit but should be planned well in advance from a tourist angle. 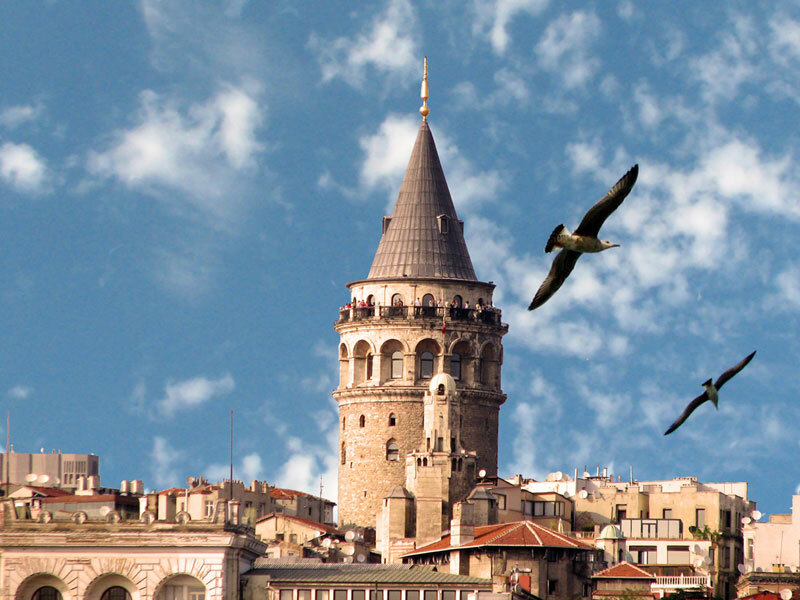 Hotel accommodation in Sultanahmet is not always easy: there are good and bad places to stay. Needless to say, I can help and arrange everything. If you get into a casual conversation with a native of Istanbul and the usual questions are asked “Where are you from?”, “Is this your first time in Istanbul?”, “How long are you staying?” and if you happen to mention that you are going on to Eastern Turkey, the chances are that he will look at you quite blankly. To most, Eastern Turkey is like a foreign country which seems a good enough reason to go. Apart from by road – not recommended – there are two ways of travelling to the east: take a normal scheduled Turkish Airlines flight of two hours or take a train which is more difficult to arrange, takes considerably longer and is less comfortable. We chose the train. My guide book says this “is not a good idea”. On this first exploratory journey my travelling companions were my lovely lady, Cilla and our very good friend Charles Comyn. Charles, ex army, had been seconded to NATO in Istanbul by the army and he and his wife had done a three year stint there. Our journey started fairly early in the morning by taking a ferry across the Bosphorus to the Asian side where the Hayderpasa station is close to the quayside. A huge Victorian building first opened in 1872 but much enlarged by German architects on orders of the Kaiser in 1908, it is incongruous but nevertheless imposing. We arrived in plenty of time for our train destination Kars in the very north east of Turkey. Our first class two berth sleeper compartment in the rear coach of the train cost £37 with Charles having the adjoining one – small, fairly clean but adequate with the restaurant car only one coach away. I wandered up the platform to the front of the nine coach train to interview the driver who kindly invited me up into his enormous locomotive where we had an animated conversation with neither of us understanding a word of what the other was saying. Bang on 9 a.m. the train pulled out of the station – the only time, I might add, that it was on time for the rest of the 40 hour journey. The early part was due east along the north shore of the Sea of Marmara before turning south eastish and climbing steadily through most attractive woodland, crossing rivers and streams and past quaint villages close to apple orchards and vineyards. Reaching a plateau the landscape changed to flat, arid scenes with flocks of sand grouse and starlings, strips of poplars for windbreaks then considerable vegetable cultivation tended by teams of peasants from irregularly spaced small townships. In the thinly occupied restaurant car a perfectly reasonable lunch was served with some drinkable wine by the attentive staff all of whom we came to know pretty well during the course of the journey. Approaching the town of Polatli an enormous statue of Attaturk with a hand raised high as if to halt any intruders, dominated the landscape. We were to see plenty of these. Around 7.30 p.m. we rolled into Ankara, the capital city of Turkey. “I am sorry, I can’t talk to you now. I’m busy” Click, the line went dead. Somewhat deflated, about twenty miles later we tried again, Hornby on the telephone this time. We did and on arrival there was Mr. Sungar and six mechanics in spotless white overalls. In no time they had the car up on a ramp and while we waited for a couple of hours they had taken it apart and put it together again. Mr. Sungar refused to accept any payment and we parted on the best possible terms vowing eternal friendship. That is not quite the end of the story. Later that night Hornby and I were having our first good dinner since leaving England when he suddenly put his hand to his mouth and exclaimed: “My God, I’ve broken a tooth.” You can guess to whom the next telephone call was made. At 6 a.m. the following morning Peter was in Mr. Sungar’s dentist’s chair and was back, tooth restored, in time for our flagged start time. Back to the train. A lot of shouting and shunting while the engine was changed from electric to diesel during which we had a passably good dinner in the restaurant car with plenty of wine to drink, enough to lull us to sleep as we rattled our way through the night. Woke to bright sunshine but noticeably colder and a changed landscape; rocky hills, steep valleys and for a while following a mountain river, the water of which was a green glacial colour. By lunchtime the journey was beginning to pall, not helped by the suitcase which doubled as a wine cellar becoming empty. Come darkness we had had enough but it was not until after midnight – and two and a half hours behind schedule – that we reached Kars where the temperature was sub zero. 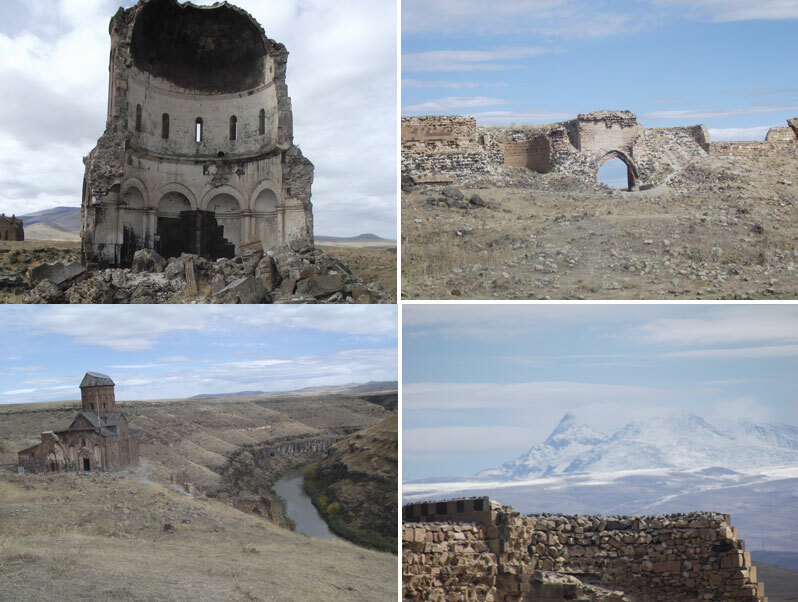 Kars is not your ideal holiday destination but it is important for two reasons, or three if you include that it is the terminus for north east Turkey for both plane and train. Reason one is that the city, which is dominated by a Hammer Film lookalike of a castle, has been tossed around like a rag doll between Russia and Turkey. It was last in Russian hands from 1878 and 1920 and formed part of the territory lost to the Turks during the declining years of the Ottoman Empire. The main reason, however, is to visit Ani, about which more in a minute. Quite a bit of admin was necessary on the morning after our late night arrival. This was the start of our journey south along the eastern borders of Turkey with Armenia, Iran and Iraq before turning westwards north of the Syrian border as far as Adiyaman. We needed a car and a driver (you cannot hire a car in Eastern Turkey without a driver). By about 10.30 we had both: the car, old and of indeterminate make; the driver young, willing, called Stavos and spoke just a smattering of English. So to Ani, 30 miles east of Kars and precisely on the present day border with Armenia. Ani was once the capital of Armenia, on the silk route and a serious rival in terms of opulence, grandeur and wealth to Constantinople until it was virtually destroyed by the Mongols in mid 11th century and finished off by a gigantic earthquake in 1319. It was a very large walled city in a wonderful setting. Now the remaining walls give notice of its former size and the remaining buildings of its former significance. The outline of the streets are there and it is possible, with a bit of imagination, to detect the various sections of the community. But what helps hugely is the almost total absence of any other people. I have been there twice and hardly seen anybody so one’s imagination is allowed to run riot. It is worth all the deprivations of long and tedious journeys. The absence of large groups of tourists is a notable feature of eastern Turkey. It can’t last but long may it do so. Our destination for the next night was a place with an unpronounceable name, Dogubayazit so we called it Doggiebiscuit, three and a half hours south of Ani. 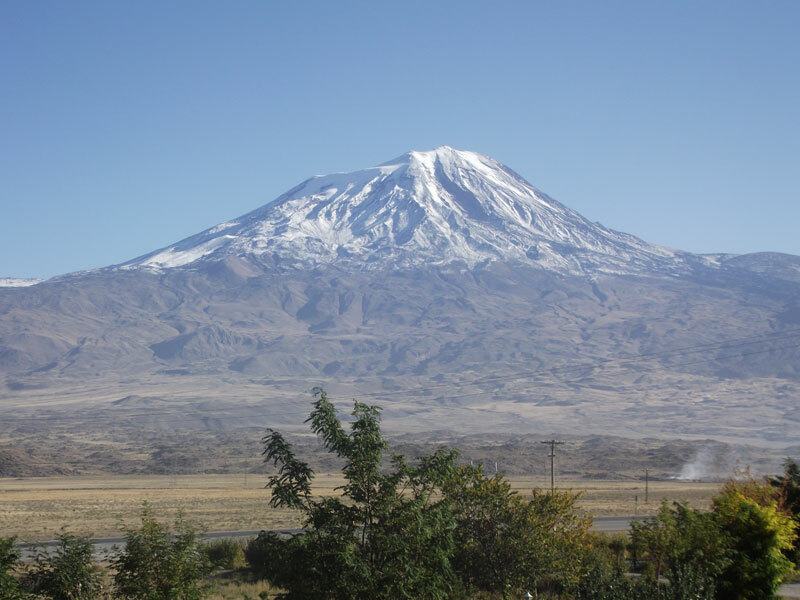 The journey took us over a mountain pass of 8,600 feet and down onto a plain out of which rose in solitary splendour a huge snow capped mountain, none other than Mount Ararat at 16,700 feet. A magnificent sight and we were to get nearer and into the foothills before reaching Doggiebiscuit. Like all stopping places on the way, there was a purpose, even other than Mount Ararat, in going to Doggiebiscuit and this was Ishak Pasha Palace. Built between 1685 and 1784 by a Kurdish Chieftain and his son, it is a huge palace situated on a hill overlooking the town; the enormous main entrance doors were removed by the Russians during their period of occupation and are now in the Hermitage in St Petersburg. The manager of the hotel in Doggiebiscuit suggested that we might like to look at the crater of reputedly the second largest meteor ever to have hit the world. It was only a very short distance away so we went. Actually it is just a large, deep hole in the ground about 25 yards in diameter but what was more interesting was that it was only 150 yards from the Iranian border and the whole area was bristling with soldiers, most of them very young, electrified barbed wire, searchlights and observation towers. We had to surrender our passports to a boy soldier who could not have been more than fifteen carrying a very sinister machine gun. Luckily he was still there when we returned twenty minutes later. Carrying on south, our next stop was Van. The main roads are really quite good – not so as soon as you leave them – and it was on this section that we came to realise that our young driver had little or no idea of where he was and certainly no idea of how to read a map. Probably he had never been more than 50 miles from Kars before. Luckily Charlie, having been a career army officer, is an excellent map reader and I am not that inexperienced either. Charlie’s Turkish was good enough to make himself understood, having lived in the country for three years but what he lacked in fluency he made up for in bonhomie, greeting everybody with tremendous enthusiasm and speaking to them very loudly in English. En route and between Galdiran and Van the road passes through the gigantic Serpmetas Lava Field stretching as far as the eye can sea on both sides. It is awe inspiring particularly when looking upwards and seeing in the distance the mountain from which this unbelievable eruption of rocks, flames and gasses came thousands of years ago. Van is the town on the shore of the lake of the same name, the largest lake in Turkey, more than 75 miles across. The lake was formed following a volcano in pre-historic times which blocked all exits. Water level is maintained by streams coming off surrounding mountains and contained by natural evaporation. It is very alkaline and turquoise in colour. There is a perfectly reasonable hotel on the shore of the lake, good enough for a couple of nights or so to visit two places of considerable interest close to Van. 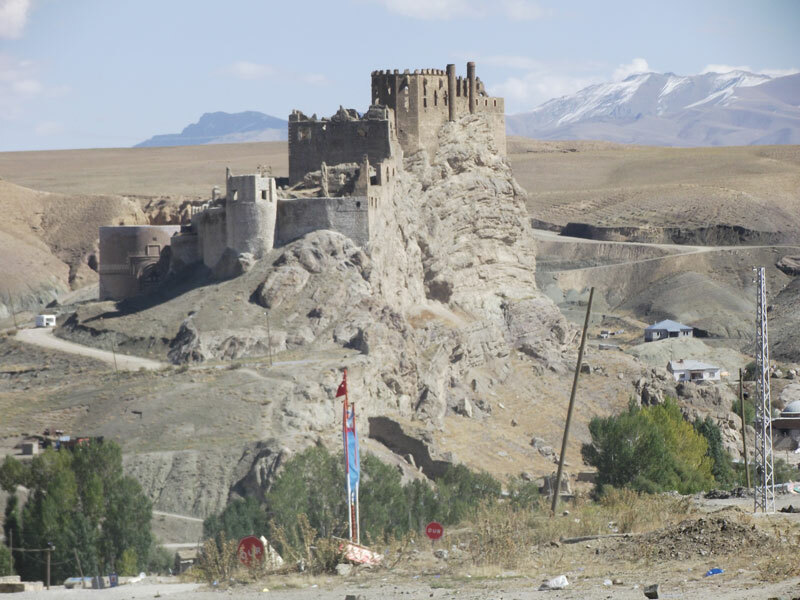 One is Hosap Castle built by an enterprising entrepreneur, one Mahmudi Suleyman in around 1643. Mr. Suleyman hit on his idea having spotted a steep conical hill on the junction of two trading routes so he constructed his castle so that he could observe caravans of traders coming from four directions and, as well as providing accommodation in the village below, he could exact dues from all for passing through his territory. Also within the castle walls he included a gladiator pit and a harem to accommodate one hundred ladies. Quite a nice little earner. The other attraction near Van is very different. 10 miles south along the shore and about 2 miles into the lake itself is the island of Akdamar. On this small, rocky island and in AD 921, King Gagik Artzruni of Vaspurkan built a palace, monastery and church. The palace and monastery have long since disappeared but the church remains in remarkably good condition with quite wonderful reliefs of mainly Biblical scenes and stories on the outside walls. Some of the frescoes on the inside are recognizable and the island is a ‘must see’. Local ferry boats operate a regular twenty minute service from the mainland. It should be remembered that now, south of Van, we are in what was once known as Mesopotamia where there was a large migration of Christians from the Roman Empire and the East in the 3rd century. Sadly Charlie had to leave us in Van to return to England. He had been to many of the places visited before (NOT the train!) and we missed him and his valuable input and humour. This left Cilla and I plus Stavos. As a postscript to Van, the hotel in which we stayed (not the one on the lake which was undamaged), collapsed like a card house in an earthquake ten days after we had stayed there. Six storeys disappeared in a cloud of dust in seconds. I have seen a video showing this taken from a CCTV camera mounted on the corner of the street adjoining the hotel. Eight hundred people in the vicinity were killed and many thousands made homeless. On our next journey in this area, seven months later, the centre of Van was still cordoned off. The next section of the journey took us into the Tigris Valley passing through and over fabulously pretty and varied country on the way – the temperature having gradually risen during the course of the journey from Kars. Along both banks of the Tigris, each a good mile wide, is a giant vegetable patch. Well and carefully cultivated it is too. 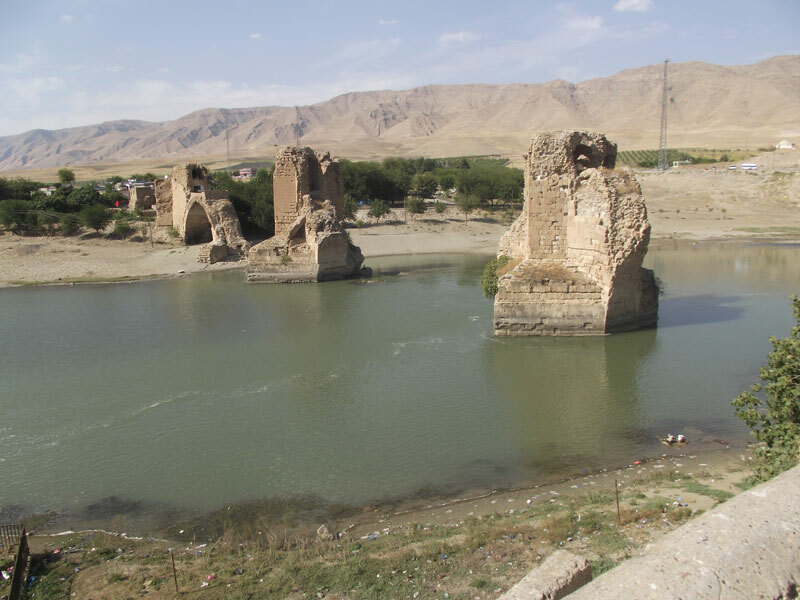 We crossed the river at a medieval village called Hasankeyf, a village with a history going back to 1800BC. There has always been a crossing point of the river here, the present modern bridge having replaced the pre 13th century one. Much of the village is immediately below a steep cliff on top of which is a castle. However, hacked out of the cliff, are many caves some of which are still used as dwellings. Very busy as a trading centre, a cloud has been hanging over Hasenkeyf for several years, that being the threat of a major dam to be built which would flood the whole area. We were now travelling south west and our next stopping place was Midyat, about 25 miles north of the Syrian border. This area from Midyat to Mardin is very well chronicled by William Dalrymple in his excellent book From the Holy Mountain written at a time when religious persecution particularly against Christians was rife. Quite close to Midyat, however, is the very famous monastery of Morgabriel founded in AD 397 by Saints Simeon and Samuel. Still a working monastery and perhaps a trifle over-restored, it is absolutely magnificent and should be seen. Mardin, about one hour from Midyat, is a simply marvellous old city set on the side of a high hill with fabulous views over the Mesopotamian Plain stretching towards Syria. 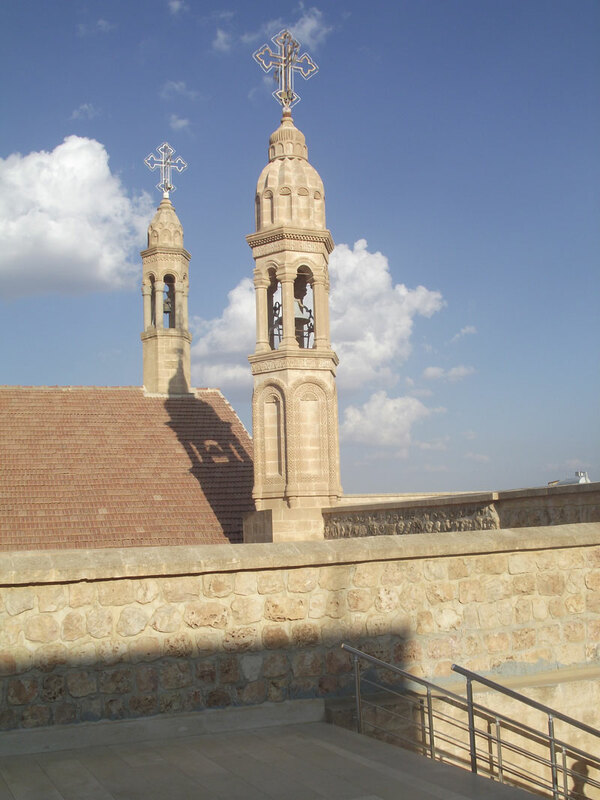 A large influx of Assyrian Christians settled here in the 5th century and even during the Ottoman Empire Muslims and Christians lived side by side. Regular services are still held in several churches. Mardin has some good hotels and one in particular, most sympathetically converted from an old building and with the best view, is well up to standard. Two days spent here would not be amiss. We are coming to the final phase of this journey heading north west, first skirting round Diyarkabir and Severek then a pretty drive down to a ferry crossing of the Euphrates river. The river, much wider and more dramatic than the Tigris, flows through a gorge separated by stark and arid hills. The terminal is no more than a rickety wooden pier and a café with an outside partially shaded area by the water’s edge. The old ferry, which can take ten to fifteen lorries depending on size, and a similar number of cars, grinds up on the bank to discharge its cargo and take on the new intake. The crossing takes about twenty minutes and then it’s an hour’s drive uphill all the way to the World Heritage Site of Nemrut Dagi. There are a number of subsidiary sites in the very large area leading up to the summit at 7,000 feet; Cendere Bridge, over the river of the same name, is one of them, built in the 2nd century AD reputedly in honour of the Roman Emperor Septimus Severus. There were four Corinthian columns, two at either end of the bridge; only three survive, the fourth having been removed by one of the emperor’s sons, Caracalla, having murdered his brother, Geta, in 212. The main attraction, however, has got to be the burial ground on the summit discovered by accident by a German engineer in 1881. Work started in 36BC by King Antiochus, the son of King Mithridates who died in 64BC. Antiochus, of Greek and Persian ancestry, collaborated with the conquering Romans as well as having aspirations of a heavenly afterlife with the gods. With this in mind he ordered his hierothesium (combined tomb and temple) to be built on the summit of Mt. 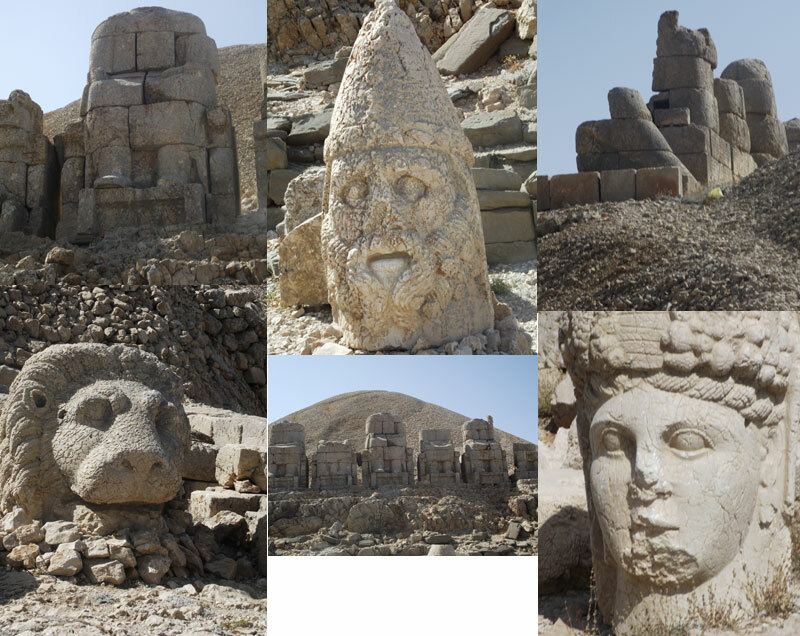 Nemrut. From an aesthetical point of view he arranged for the summit to be raised some fifty yards with small rocks and shale into a perfect cone. Surrounding the base of the cone he had statues of gods, whom he hoped would become friends after his death, erected: such as Apollo, also known as Hermes, Zeus, Fortuna and Heracles, plus himself of course! The road to the summit is long, narrow, very steep with a series of tortuous hairpin bends Even now the last five hundred yards has to be on foot (not too difficult, a well trodden path and takes twenty to twenty five minutes) but how this immense work involving massive manpower was accomplished well over 2000 years ago defies imagination. The bodies of the statues are long gone or disintegrated but the heads are still there and each one of them measures over six feet! What a way to finish a journey. Adiyaman is only a one hour’s drive from the base of Mount Nemrut from where a one and a half hour flight takes one to Istanbul with onward connections to pretty well everywhere. In summary, don’t attempt this journey in winter and although it was an experience not to be forgotten, probably the guide book writer who wrote that the train journey was “not a good idea” was correct. Please note that following the exploratory journey described above, we have made subsequent visits and now have arrangements set up providing guides, comfortable transport in a/c cars or minibuses and can make all hotel reservations en route. In other words a fully fledged service for accompanied or unaccompanied parties.